cleanser / steriliser 250 grms. 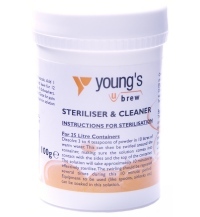 Ideal for sterilising all your brewing equipment. Simply dissolve 3 to 4 teaspoons of powder into 10 lts of warm water. This can also be used to sterilise kitchen implements too.